After Blackberry announced disastrous Q2 results, news broke that Fairfax's offer to take the company private had hit funding snags as pension funds were uninterested. This shouldn't be particularly surprising, but it means that a break-up is now the most likely outcome for the embattled smartphone manufacturer. Let's use Blackberry as a lens to see what we can learn about declining businesses. The easiest takeaway from Blackberry's decline is that no single company can compete against an established ecosystem. 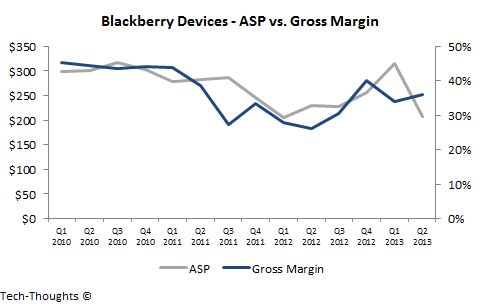 Blackberry's decline began once iOS and Android were firmly entrenched as leading mobile ecosystems. Blackberry failed to understand that creating a viable ecosystem around the BB10 operating system was extremely unlikely given the timelines. By the time BB10 was productized, iOS and Android already held dominating positions in the market and developers had no reason to look back. It is possible to compete with ecosystems, but only with a truly disruptive product that offers consumers a new user interface paradigm with a new form factor. New user interface paradigms need new types of applications and, therefore, attract a different breed of developers. However, this requires a much longer time horizon as the new platform/ecosystem needs to improve sufficiently to challenge the incumbent platform. The transition from the PC to tablets in the consumer market is an ideal example of this pattern. There is a tendency among industry watchers to gauge the future of a company based on feedback from the company's best customers. Unfortunately, the highest or most demanding tiers of a customer base are often the worst judges of an established company's prospects. While Blackberry's business was being disrupted by the iPhone and Android smartphones, their core "enterprise" and "prosumer" markets remained fiercely loyal. Many analysts remained steadfast in their opinion that Blackberry's core customer base would ensure the company's relevance in the years to come. The problem with the "best" customers is that they provide no information about the dominant basis of competition in the industry, i.e. the mainstream market. Blackberry's core user base always held the opinion that their email/messaging services and hardware keyboard gave the company a sustainable competitive advantage over competitors. Unfortunately, while industry watchers were preoccupied with those features, the basis of competition in the mainstream market shifted to ease of use, availability of apps, full featured browsing, etc. Blackberry's market cap peaked in 2008, a year after the iPhone was launched. In fact, some of Blackberry's best financial results came after the mobile computing disruption was well underway. While Apple and Android OEMs focused on the shifting basis of competition in the industry, Blackberry was content with milking their existing user base. However, once the basis of competition shifted, Blackberry could do nothing to regain its competitive advantage. Therefore, it is impossible to gauge the prospects of a company purely by tracking short-term financial results. The true test of a long-term strategy is how well it fits with the evolving basis of competition in the industry.